Do I receive a card or certificate upon successful completion of an on line course? Yes. Upon successful completion of your course a certificate will be generated. The certificate will be available in Your Exam center. You can view and/or print this certificate in either standard or wallet size. To print out your certificate in wallet size, choose to print the regular sized certificate at 35% of the original. To do this, choose File -> Print. On the print screen, choose Properties, and reduce the size to 35% on the Paper tab. No. Your purchase is limited to single user access. Does your site keep track of my course completions and scores? Yes. Our site keeps track of every course and exam you take, the answers that you select, and the scores for each exam. It also gives you performance benchmarks and lets you know how you are doing in all areas. Should you lose your certificate simply log back in to your account and print it again. Can I review the courses that I take? Yes. You can open and review any of your course marks in your history. Just as you were taking the course, you can open your course exams and view the answers you selected, and whether you got them right or wrong. Can I pause my course, and come back to it later? Yes. A course can be paused at any time for later use. When you are ready to continue your course, simply log back in and go into history, select your paused course , and continue on. How's your course different from other on line courses I've seen? We have developed what we think are the easiest and most effective on line courses available, some courses use flash media or scrolling paragraphs that often go to fast for the student to absorb in which case the student misses most of what’s in the paragraph. Others use programs that are very difficult for the user to understand how to use. Our on line courses were created with simple text and pictures so that you can scroll up or down and learn at your own pace without having to speed read or take a computer class. Sure modern technology is nice but what good is it if doesn't help you in the learning process? I've noticed other services offering certification "accredited" by American Heart Association. Why aren't you? It is important to understand that neither the American Heart Association nor the American Red Cross are government agencies and do not have the authority to "accredit" any other facility's CPR courses. How are your on line courses different from American Red Cross or American Heart Association? There not, All rescue techniques demonstrated in our courses meet and often exceed minimum requirements established by most States' licensing boards as well as standards recommended by the 2005 AHA International Guidelines on Cardiopulmonary Resuscitation and Emergency Cardiovascular Care (ECC), ILCOR, and OSHA. The only difference is that you don’t have to stand in front of a classroom of people you don’t know and because of that we think you will have a much better learning experience. We offer a nationally equivalent certificate for all of our on line courses just like the others. The American Heart Association, The American Red Cross and The National Safety Council all offer some version of on line CPR, First Aid, AED etc. so in other words we're not doing anything that isn't already being done we're just going to do it easier and a lot less expensive . 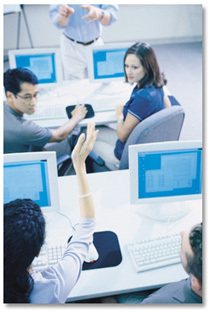 What is the difference between classroom BCLS courses and your on line courses? We think there are a lot of people that simply aren't comfortable in the classroom setting, with an on line course the student is free to learn as fast or as slow as they choose, you can come and go as you please and take as long as you wish to complete our courses. With our courses you are allowed to log in and out anytime of the day or night for as long as it takes you to complete the course. Some courses that are taught in person only require the student to be present and as long as they have attended from start to finish they get a certificate. Our courses all contain a course test. If the student doesn't pass the test they are allowed unlimited opportunities to study and retake the test. What does that mean? One way or the other there going to learn and of course get a certificate. Yes. Every student has unlimited access to the course material from the date of registration. The final exam is designed to evaluate how well the student has retained the course information and consists of multiple choice and true or false questions covering all sections of the program. Although most students receive a passing grade on their first attempt, the exam may be re-taken as many times as necessary during the registration period. Our CPR certificates are good for 2 years, our First aid is good for 3 years and our AED is good for 2 years. All of others are listed in the course description. Please remember to include with your payment your name, address, telephone number and email address. Once payment is processed you will be contacted by email and given a user name and password. Once registered you will have instant access to the course you have selected and all its features. How long does it take to get my certificate once I have successfully completed the course. Instantly! Once you have successfully completed the course test you will be directed to an area of our site to print your certificate. We are here to help. Our support team members are available 7 days a week, 365 days a year and take great pride in providing all students with prompt attention. it is important for you to understand that we don't just want to get your money we want to get your business and more importantly we want to keep your business both now and in the future which is why we are more than happy to offer a Money Back Guarantee. 2. The request must be accompanied by a copy of certification from an alternate facility dated within 45 days of the request for a refund. 3. Exceptions to items 1 and 2 above may be granted at sole discretion of Safety Concepts. The refund of the student’s registration fee will be issued by the same method as the original payment was made. Although every effort is made to issue refunds promptly, it may take up to 45 business days for the refund to post to the student's account. Safety Concepts reserves the right to deny any request for a refund which it determines in good faith to be fraudulent or otherwise intended to abuse its Money Back Guarantee. Safety Concepts determination shall be final. Please note, if you took one of our combined courses and only a portion of the certification is not recognized as mentioned above, only that portion will be refunded, For example let's say that you took our Adult CPR/First Aid/BBP course at $39.95 and your license authority would accept everything but the CPR portion of the course, we would refund $13.31 of your $39.95 purchase, since there were 3 courses taken you would receive one third of your $39.95 purchase. What this does is allow you to get the certification that you need to comply but still allows you to retain the portion that is accepted that way you won't have to retake the entire portion of the course all over again.